I hope you and your koi have a great 2015. My year started by taking a few scrapes on New Year's day, and it was an opportunity to take a few pics and video of one or two kohaku that stood out. And here's one of them. 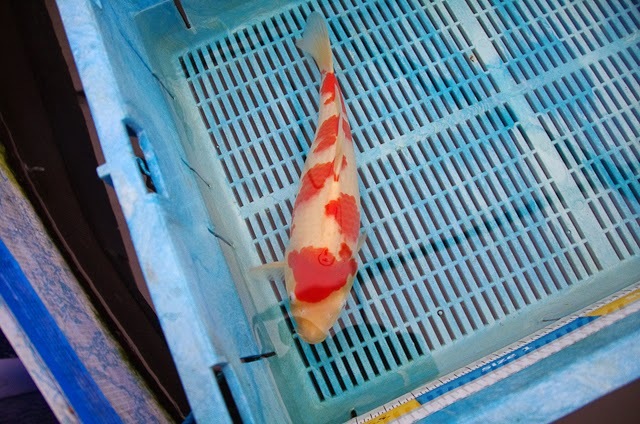 This kohaku measured in at 33cm - and remains one of the largest few. The difference between the sizes and shapes of the May 2014 bred kohaku's has become much more noticeable now - which is helping me estimate their developing trajectories. My plans for the rest of the week include more scrapes, and also netting the July 14 bred kohaku's and going through them to get a better idea of where I am with that spawning.